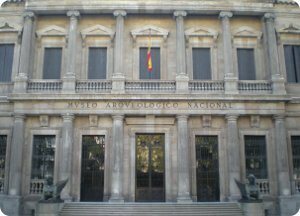 The National Archaeological Museum of Spain, in Madrid, contains a wealth of exhibits from Spain and beyond, ranging in date from prehistoric to Renaissance times. Housed in a Neoclassical building, the museum shares a roof with the National Library. The Museum was founded in 1867 by Royal Decree of Isabel II. Its creation was motivated by the need for a museum, as in other European countries, they could save, classify and explain the archaeological, ethnographic, decorative arts and numismatics, the Spanish monarchs had gathered at the Royal Library, the Royal Cabinet of Natural History and other institutions. It contains a wealth of religious art. Many of the exhibits were removed from churches and monasteries and there are many ancient sacred artifacts as well. One of the most popular exhibits is an underground replica of the prehistoric cave paintings discovered in Altamira, Cantabria (in northern Spain, in 1868). For preservation reasons, access to the original is highly restricted. The paintings feature bison, horses and boars. 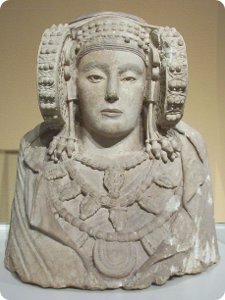 A highlight of the main museum is Lady of Elx ("La Dama de Elche", in Spanish), a bust of a wealthy 5th century BC Iberian woman. Her elaborate headgear is a precursor to the mantillas and hair combs of traditional Spanish dress. A collection of visigothic votive crowns were discovered in 1859 and have been dated to the 8th century. And a beautiful choir stall from the palace of Palencia dates from the 14th century. There are also Greek vases, Roman mosaics, and various exhibits from Ibiza, Paestum, and Rome, including statues of Tiberius. Other collections include Spanish Renaissance lusterware, Talavera pottery, Retiro porcelain, and some rare 16th and 17th century Andalusian glassware. Tuesday to Saturday: 9:30 to 20:00. Sundays and holidays: 9:30 to 15:00. * Line 4 - Colón or Serrano stations.